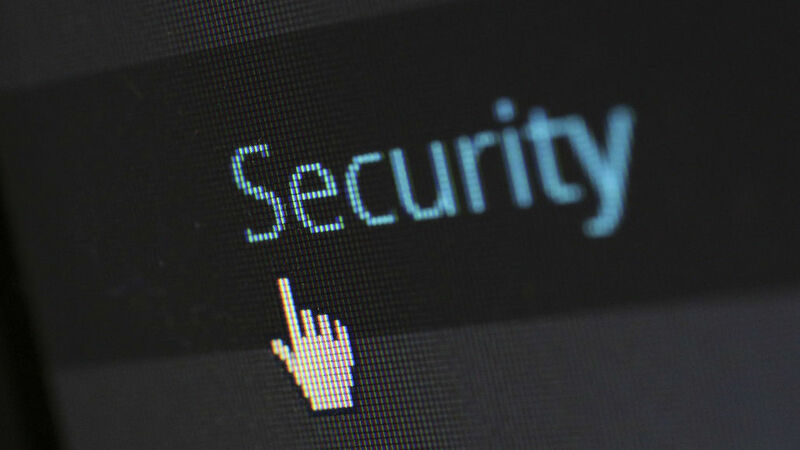 Every year I ask myself, is it time to get security software for my Apple Mac? So far the answer has been no, but malware is growing and maybe it’s time for an app like VirusBarrier Scanner. 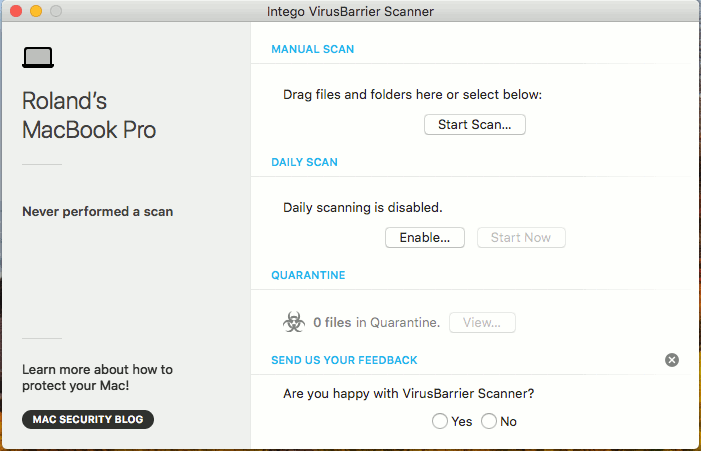 VirusBarrier Scanner is in the Mac App Store (just search for it and install it), and it aims to protect your Mac from malware for free. 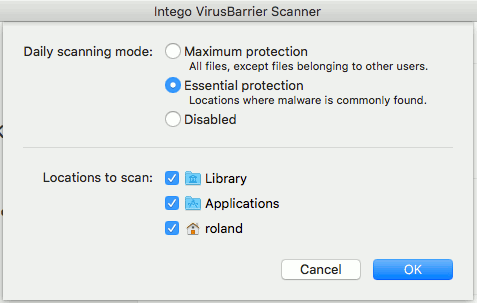 It is from Intego, which is a well-known security company that has been producing paid apps for protecting your Mac for many years, so they know a thing or two about keeping macOS safe and secure. To get an app in the Mac App Store you must play by Apple’s rules and these prohibit certain activities. For this reason, VirusBarrier is only a scanner and it does not offer live protection. It is basically a clean-up tool. It also requires you to give permission for it to access drives and folders. Without it, it cannot access files, but his is a once-only thing when it is first used, so it isn’t an issue. The app can be run whenever you suspect a problem and a manual scan can be performed or you can schedule daily scans. 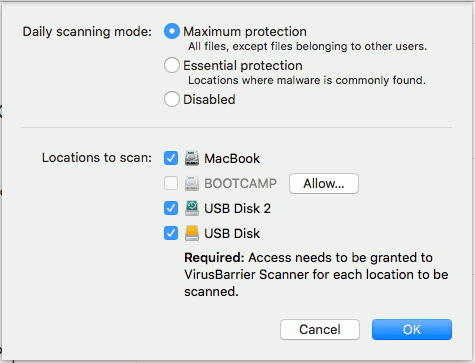 Given that the Mac is fairly secure anyway and malware is rare, a daily scan isn’t perfect from a security viewpoint, but is probably adequate for most people. When setting up the app and on the home screen, there is an option to enable daily scanning. Select the Essential protection option and you can give the app permission to scan the Library, Applications and your home folder. These are the locations where malware is most often found. It cannot access files in other user accounts. 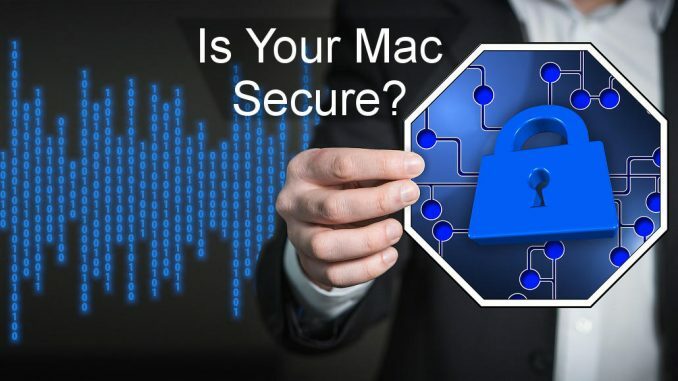 Choose the Maximum protection option and you can allow it to scan the Mac’s drive, and external drives you connect to or plug into the Mac. Scan results – malware found! Click Start Scan on the home screen and you can choose which folders to scan. Folders to be scanned can also be dropped on the app, too. If daily scans are set up, you can start one at any time by clicking the Start Now button. Surprisingly, it found malware on my Mac. 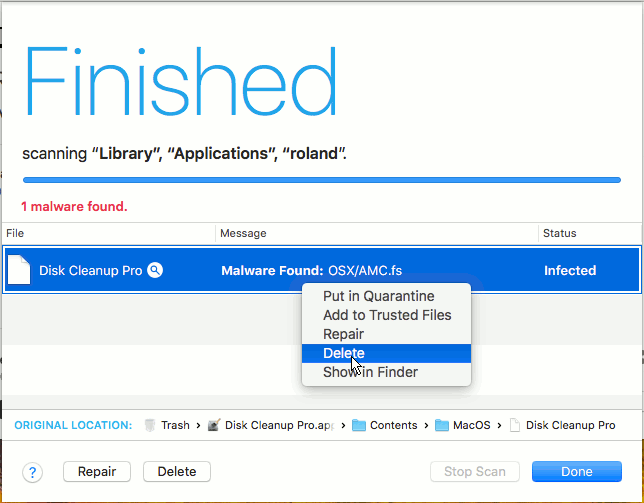 Disk Cleanup Pro is an app in the Mac App Store, so shouldn’t it be safe? Here is the page on the Intego website and it looks like Disk Cleanup Pro is another name for Advanced Mac Cleaner, which Intego classes as scareware. The app claims to find a lot of issues with your Mac and then tries to get you to pay for the full app to clean them up. So it is not exactly malware, but it is certain undesirable. I can’t remember why this app was on my Mac. It is in the Trash, so I suspect I tried it and didn’t like it, coming to a similar conclusion as VirusBarrier Scanner. There are some options in Preferences that enable you to tweak a few settings. For example, scanning can be made more efficient by only looking at new and modified files. This means the app does not have to check every file every day, which is a huge task. There is also an option to scan/ignore archives. Scanning inside zips is slow, so ignoring them speeds up the app. 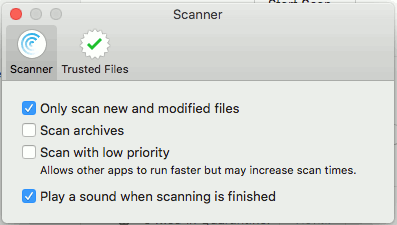 An option to scan with low priority makes the app use less system resources, which is useful for scanning in the background while you do something else on your Mac. I have not tested the app against every type of malware out there, but in my limited tests it seems effective. It did actually come up with a PUP (potentially unwanted program), and it was from the Mac App store, so maybe it is time to take Mac security more seriously. If you have an old Mac with a mechanical disk drive, scanning is very slow, but that is the fault of the drive and not the app. Recent Macs with solid state drives are much faster. I don’t usually keep security apps on my Mac for long, partly because they never find anything, but this one did, so I might keep it for a while and see if it comes up with anything else.